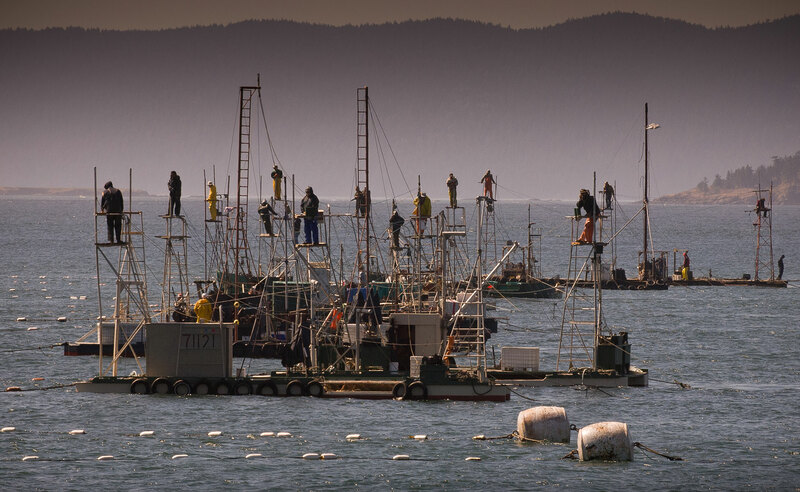 Reef net fishermen work to catch sockeye salmon off the shores of Lummi Island in Rosario Straight. Using a fishing technique that was invented by Coast Salish native Americans and is unique in the world, a handful of "amateur" commercial fishermen spend their free time in the summer and fall netting salmon that swim down a gauntlet of lines and into a net rigged between two boats. A spotter in a tower on the front of the boats gives the signal to haul when he sees the targeted fish species swim into the net (while letting non-targeted fish escape). In the 1950s over a hundred reef nets were rigged along this shore but now market conditions have turned this environmentally sound and picturesque fishery into a hobby business and only nine crews remain.